"The US Marine Corps was founded in Philadelphia on Nov. 10, 1775 in a tavern during the American Revolutionary War. The name of the tavern was 'Tun Tavern.' There is an exact replica of Tun Tavern at the Marine Corps base in Quantico, Virginia. It was at Quantico in this Tun Tavern that the US Marine Corps Martini was born over 50 years ago. It has been made and served all over the world. Is it a killer martini? More on that later. It is sometimes referred to as the 5-4-3-2-1 Martini. To your health and good cheer! 'Freedom is not free, but the U.S. Marine Corps will pay most of your share.'" Lots of folks figure that because these are US Marine Corps Martinis they must be wildly strong. This is not at all the case. Most professional bartenders serve a martini in which the ratio is four (or five) parts gin to one part vermouth. The vermouth is itself 16% to 18% alcohol. The Marine Corps Martini is indeed much milder. There are nine parts liquor to five parts dry sherry and water. This is a martini in which the liquor ratio is 1.8 to 1. Not only is the mixture half as strong as the normal martini, the one part water and three ice cubes further reduces the alcohol content. These are not Marine Corps killer martinis. The problem is that these martinis are so smooooth, one tends to drink them too fast and drink too many. One or two are enough - and beyond that be sure to name your designated driver!! 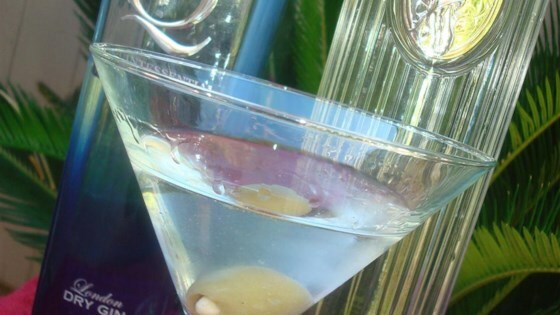 Serve the martini, as is your custom, with olives or a twist. Or serve with pickled onions, changing it from a martini to a Gibson. Serve with an olive and an onion, and you have a Gibtini. I serve this at all of my husband's parties, he was in the Corps for 30 years. I didn't have sherry so I used very dry vermouth, and we like Gin, so I switched the amounts of Gin and Vodka. We REALLY enjoyed these!